Waylon Jennings was born in 1937 from Littlefield, Texas. He is an icon in the American country music industry. Jennings had a distinctive voice that everyone recognized. In his early career, he played bass for Buddy Holly. When the plane crashed that took several talented musicians Buddy Holly, The Big Bopper and Richie Valens, Jennings was booked on that plane ride. However, at the last minute, he gave his seat to The Big Bopper. Jennings may be remembered mostly for his work on the “Dukes of Hazard”. He was the voice of the announcer as well as sung the theme song. Jennings had several hit songs including “MacAuthur Park”, “Delia’s Gone” and “Just to Satisfy You”. Among his achievements, he has won various awards, including “Lifetime Achievement Award”, “Male Vocalist of the Year” and “Album of the Year”. Jennings was elected to the Country Music Hall of Fame in 2001 and inducted to Hollywood’s Rockwall in 2006. 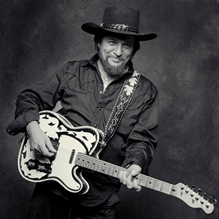 Waylon Jennings died in 2002 from diabetes complications. He was 65 years old. Jennings had several health problems through his life, as well as a cocaine addiction. He became sober in 1984, but other issues became apparent. Jennings had a heart attack as well as diagnosed with diabetes. The diabetes began because of a starving hunger that was brought on because of his addiction. The music sensation had to have his foot amputated because of the rising problems with his diabetes. Waylon Jennings went to sleep one night and never awoke again. This entry was posted in Top 50 Celebrities With Diabetes on June 30, 2010 by admin.